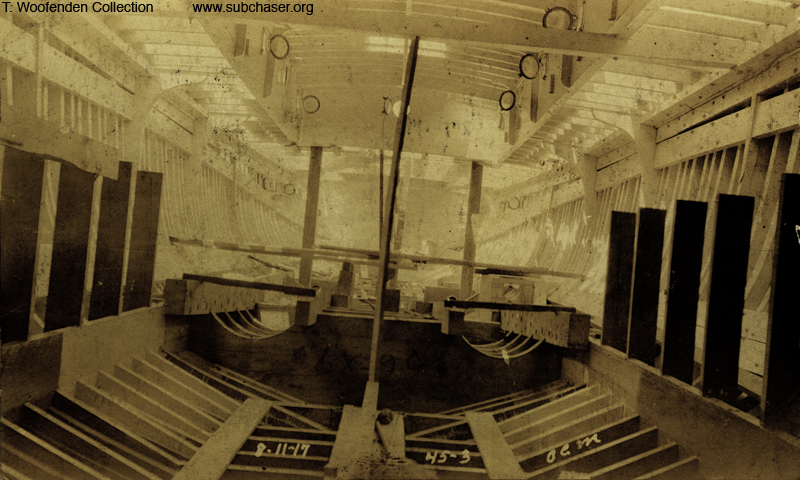 A rare interior photograph of a 110' submarine chaser under construction, with the rib frame structure and sheathing completed but no interior compartments built. Note the reinforcement in the middle of the shot. This is the support structure for the engines. Above it is the main deck house, with port holes installed. Handwritten notes indicate that this is SC 9. SC 9, built at the New York Navy yard, was commissioned under the French flag on 09 August 1918 in New York, and designated C 3.